Description: Sexes similar. 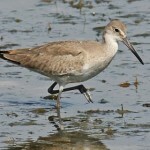 Large, long-legged shorebird. 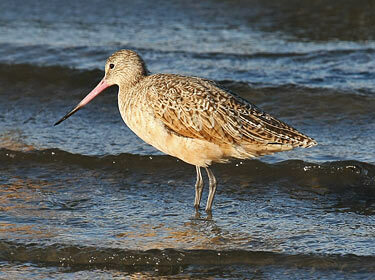 Long recurved bill; bill is orange with black tip. Tawny-brown all over; black mottling above and black barring below. Distinctive cinnamon wing linings and primaries are visible in flight. Juveniles are similar but with less barring. 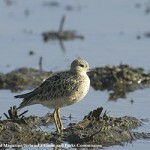 Habitat: Migrants can be found on mud flats, wet fields, sand bars, and shorelines. Where in Nebraska: Uncommon to locally common statewide. More common during spring than in fall and more common in the west. There area a few modern breeding records from northwestern Nebraska. 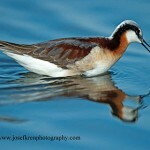 “Fall” migration may commence as early as late June. Status: May have been a regular breeder in Nebraska at one time. Fun Facts: Incubating adults rarely flush off their nests and can sometimes be picked up off the nest.